Let's face it, everyone knows I have an enormous stash of soaps. So, in an effort to reduce it to manageable levels, I decided to have a "face-off" of sorts today. 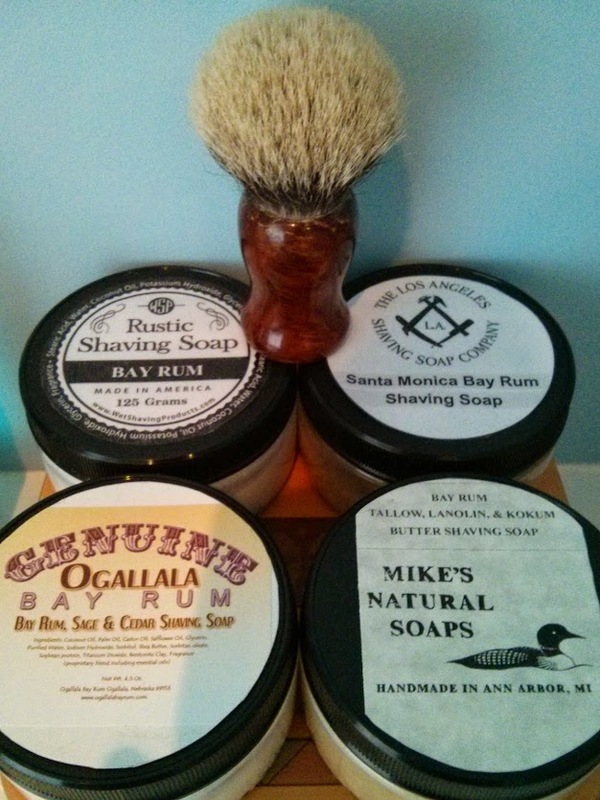 I took out my 4 open US-artisan bay rum soaps and do some testing. Wet Shaving Products (WSP) "Rustic" Bay Rum. Los Angeles Shaving Soap (LASS) "Santa Monica Bay Rum"
All 4 soaps are in identical containers (8oz plastic screw top) to remove any differences due to container type/size. All were lathered using the same brush. The brush was thoroughly rinsed and soaked in warm water between sessions and each soap was lathered several times to account for different variations in technique and moisture levels. Standard loading of 20 swirls on each puck. To determine residual slickness, I "shaved" the lather off using a razor that had the blade removed, then rubbed the bare skin with my fingers to see how slick the skin was for simulated "buffing" of the razor. Winner: Tie. LASS and Mike's. The scent between the LASS/Mike's soaps were not identical, but equal in strength and pleasantness. The other two soaps were good, but lacked the strength of the LASS/Mike's. Winner: Tie. Ogallala and WSP. Where these two trailed the others in scent, they more than made up in this class. The WSP began to lather nearly immediately (after 3 swirls) while the Ogallala started to lather between 4-5 swirls. Each built WAY more lather than the LASS/Mike's combined after the prescribed loading. The Mike's soap took about twice the amount of time to build a quality lather than the other three. This was a tough call. The Mike's put in a really good show but was a close second after the LASS. The volume, density, slickness and residual slickness of the LASS was superb. What are YOUR thoughts about these particular soaps? Do your experiences match mine or is it another case of YMMV? The whole point of this test (for me) was to figure out which one(s) to sell on BST to cull the herd. But to be honest, they are all great soaps in their own right. Each for different reasons. So my original reasons are now moot, since I'll be keeping all of them. I did not test Stirling Bay Rum since the only puck I have is in the BST right now. I also did not test Barrister & Mann bay rum since I only have a sample slice and I ran out of containers so it wouldn't seem fair to test it as-is. Seems like you had fun, Erik! I find Mystic Water Bay Rum has a very unique Bay Rum scent and the best I have tried, so far. Funny, these two were among the first soaps that I purchased on my return to wet shaving and are probably my least used. I am very fond of bay rum, and the variety of interpretations seems endless. The Ogallala bay rums were not impressive for me. I guess I should give their soap a try, but I purchased the aftershave sampler they have, and I was really looking forward to the lime/peppercorn. They were all, however, without exception very disappointing - very little smell with any of the five. I think that an approximation of the scent level could be achieved by putting a thimble full of Captain's Choice in about four ounces of water. I have to say that my favorite bay rum aftershave is Captain's Choice Cat-o-Nine-Tails. I bought a tub of RazoRock Captain's Choice Bay Rum shaving soap and was very disappointed - almost no scent at all! It lathers quite well, but I bought it for the scent. It is unlikely that I will be buying any more RazoRock or Ogallala. I just had my own battle of Bay Rums. I worked through a Mystic Waters sample, B&M sample, LASS Sample and finally the Strop Shoppe Bay Rum. Like you I found the LASS as good as anything. It was crazy easy to lather. Minimal loading resulted in a copious amount of thick and protective lather. That was a great soap. The B&M was a fast ball over center plate. It was an incredible blend of spice and depth. I love B&M soaps so the performance was typical stellar B&M. The MW and Strop Shoppe smell VERY similar. If they're not using the same fragrance oil(s) whatever they are using is very similar. When Mystic waters is on, it's great. It's just temperamental. The shave was always awesome and the post shave is great. The strop shop is easier to lather. The post shave on the strop shoppe is also stellar. For my particular skin (dry/flaky this time of year) the strop shoppe is awesome. It's like shaving with a moisturizing mask every day. No duds in the lot. I'd recommend all of them for different reasons. I knew going in I would love the performance of the B&M and the strop shoppe. The LASS was a pleasant surprise. My first go with that brand and I'm glad I tried it. I ordered a bunch of samples from Maggards. Final takeaway was what a wide and delightful spectrum Bay Rum encompasses. I love Bay Rum in the fall and winter. This year I'm working through a tub of strop shoppe. I'm following it up with strop shoppe, Captains Choice, HTGAM and Krampert's bay rum splashes. I also just ordered Pens Bayeola which, from the sample, will complement the more cologny take of bay rum of the strop shoppe.